Имате въпрос към Amax Condo Makati? Независимо дали сте турист или пътувате по бизнес, Amax Condo Makati е перфектен избор за настаняване в Манила. Хотелът се намира се на 8.4 Km от центъра на града, поради което неговите гостите могат безпроблемно да се наслаждават на всички градски атракции. С удобното си местоположение хотелът предлага лесен достъп до всички градски забележителности, които задължително трябва да се видят. Amax Condo Makati също така предлага много съоръжения за обогатяване на Вашия престой в Манила. Най-важните съоръженията на хотела са безплатен WiFi достъп във всички стаи, 24-часов рум-сервиз, 24-часова охрана, ежедневно почистване, достъп за инвалидна количка. Като допълнение всяка хотелска стая предлага широка гама от удобства. Много от стаите са с телевизор с плосък екран, почистващи препарати, стойка за дрехи, безплатно разтворимо кафе, безплатен чай, за да удовлетворят и най-изискания вкус. Хотелът разполага с голямо разнообразие от развлекателни съоръжения като фитнес зала, открит басейн, детска площадка, детски клуб, басейн (за деца). С превъзходните си удобства и отличното си местоположение Amax Condo Makati е идеално място, в което можете да се насладите на престоя си в Манила. Само при поискване се извършва почистване на стаите. Guests are required to check-in at Amax Inn Makati. The property provides shuttle service to Amax Condo Makati. Отседнахме 7 вечер/и в април 2018 г. It has a stunning view , relaxing place and the staff were easily to get in touch with , wifi connection is fine plus you got landline aswell you can call easily to any local numbers around manila. I emailed the hotel they responded at first but when I mentioned the hotel cockroaches they did not answer. Within walking distance to Greenbelt and close to WalterMart and Makati Square. The street look dark at night and a lot of homeless people sleeping at the street. The Condo 3422 at Oriental Place need a good cleaning and to be sprayed for cockroaches before I can recommend the Condo. No cooking facilities at the place. Internet is very good and working well 24/7. Immediately we moved in the room we found out cockroach on the floor...but it was not only one...there were hundreds of them behind each furniture, inside cabinet, behind fridge...I never saw something like that! Because i complained about that we were moved from condo back to "main" hotel into room with only single cockroach in the cabinet and stinky baathroom. I bought Mortain spray in 7/11 store and sprayed whole room before we go sleep. I can't recommend Amax to anyone. Dear Ms. Stacy, Thank you for taking the time to share your experience. We are extremely delighted that you felt at home with us and that your stay was comfortable and enjoyable. Please know that your feedback is encouraging as we strive to provide our guests a memorable experience. Once again, thank you and we look forward to welcoming you back. Our stay was too short, but we will definitely come back. The view of the city at night from our room was wonderful. Dear Ms. Sheryl, Thank you for taking the time to share your experience. We are extremely delighted that you felt at home with us and that your stay was comfortable and enjoyable. Please know that your feedback is encouraging as we strive to provide our guests a memorable experience. Once again, thank you and we look forward to welcoming you back. Within walking distance to Greenbelt, Burgos Street, and just down the street from WalterMart. Being on the 34th floor, the condo offers a great panoramic view of the city and is cozy enough. In addition to the room itself, the big plus is access to the swimming pool and gym on the 6th floor. A couple of minor gripes: cigarette butts were often floating in the pool but the water was filtered and cleaned daily. Not much the staff can due, I suppose, when people smoke on a non-smoking floor and the wind blows the butts in the pool. The gym is also small and can get crowded. Otherwise, the place is great for location, facilities and price point. Last suggestion: taxi drivers may not know the place as the complex itself is actually called Oriental Place. If they still do not know, I would advise to tell them near WalterMart. Very accessible location,Walking distance to waltermart and makati square. Friendly staff wealso ask some direction and even they're not so familiar with it, they put some effort just to give us some info. When we arrived internet is not working, We called to them and immediately someone was sent just to make sure it will be fix, Shower is not working, A little bit dusty. But its okay no serious issue to be complained of, Cheap place, Great View, Great experience!!! I'll rent this unit again, Its so worth it !!!! I liked the view from the 34th floor. The room was nice and quiet and there is a refrigerator. 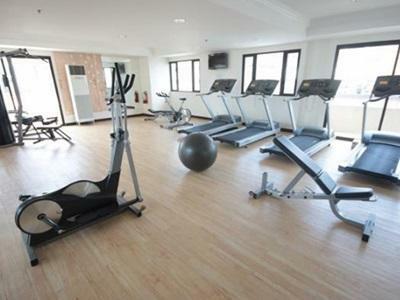 You can use the gym and swimming pool also for no charge! Room was not kept in good repair and somewhat dirty. But for the price, I think it is a good enough place to stay. Location is hard for taxi drivers to locate if they don't know Makati. Staff is helpful& friendly! The Amax Condo is quite a long way from the Amax Hotel. When I arrived, the condo had not been cleaned (floors dirty and previous tenants goods lying about). The internet was also not functioning, but within 48 hours they had rectified the problem (account was unpaid). During my 5 night stay, the room was only serviced once. Poor service aside, the condo is located near Makati Square and Walter Mart as well as the Skyway. Getting anywhere was easy and taxis are readily available in the area. If the service were better, I would stay again.